Single seater champion Toby Sowery will make his Lanan Racing return at the opening round of the BRDC Formula 4 Championship at Snetterton on March 27-28. Sowery, a 2015 McLaren AUTOSPORT BRDC Award finalist, steps up to BRDC F4 after racing a part-season in MSA Formula last year. He will partner Akhil Rabindra at Lanan Racing. The move reignites the partnership that dominated the 2014 F3 Cup championship, winning 10 of the 14 races contested and finishing inside the top two in each. 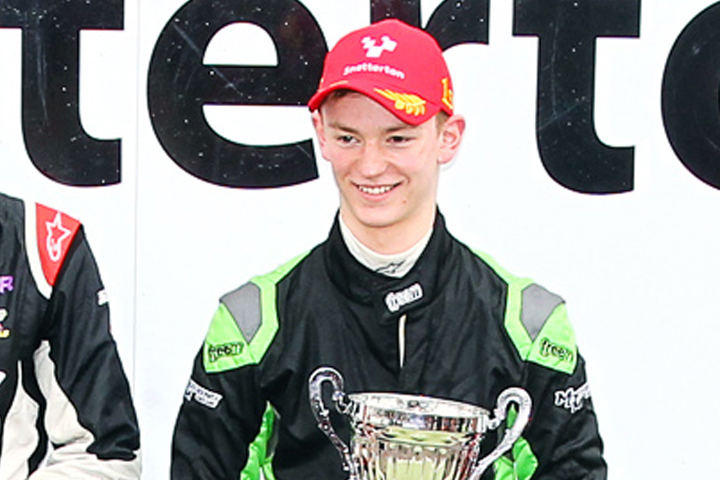 The haul of wins included a double win on his Formula 3 debut, also at Snetterton. He added the MRF title during the winter of 2014, winning four of the 12 races and finishing on the podium in all but three. BRDC Rising Star Sowery, 20, said: "I can't wait to be back out in a car again, especially wth Lanan. We had an amazing time working together to win the F3 title, which should set us up well for the new F3-like F4 car. It already feels great, I'm looking forward to winning some more races." Lanan Racing team principal Graham Johnson said: "It's great to have Toby back and to give him this chance. He is a proven front-runner. We are confident the car will be very competitive so I am absolutely sure he'll be straight to the front. "Given his experience relative to his age he will be a valuable asset to the whole of the Formula 4 team, too. He is going to difficult to beat." One seat remains available at Lanan Racing in the BRDC Formula 4 Championship, for more information contact team manager Graham Johnson by emailing graham@lananracing.com or by calling 07970 685498.